There was a time, my good friend, when dragons did not walk the earth. But man has never known such a time. In fact, to sepculate about such a time sparks only a cruel hope. It is a fable for children; those humans that wish for such a world sharpen their blades for a battle they surely cannot win. Man is destined to serve, cowering in fear beneath the shadow of the dragons - magnificent beasts of such magnitude that words fail to describe them. They cannot be fathomed by our primitive minds. Surely, we can see them, talk about them, hunt them, even catalogue them in arcane works lost to the whim of age. But we cannot, and shall not in my lifetime, ever know what truly makes these wondrous forces of nature what they are. I only hope that future generations of man have the will to fight against that which cannot be destroyed. 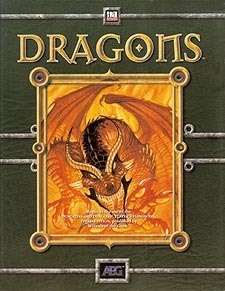 This sourcebook contains eveything a GM or player needs to campaign in a world of dragons. Hunting, training, or riding them - even cutting up the pieces and seling them for alchemical powders - all these possibilities lie within the pages of this tome.